KIDS LOVE BUILDING & BLASTING! Blaster Boards® are like life-sized Lego, so kids can creatively build the forts and bunkers of their imagination! The included targets spin when hit, making Nerf play extremely fun. Blaster Boards® transforms bedrooms, backyards and parks into fun battlegrounds! Blaster Boards® snap together easily, allowing kids to build all kids of bunkers, forts, tunnels and shields. The parts are made of a shatter-resistant polymer and will last for years of use indoors or outdoors. Store your Blaster Boards set away compactly when not in use, or take it with you to the park. 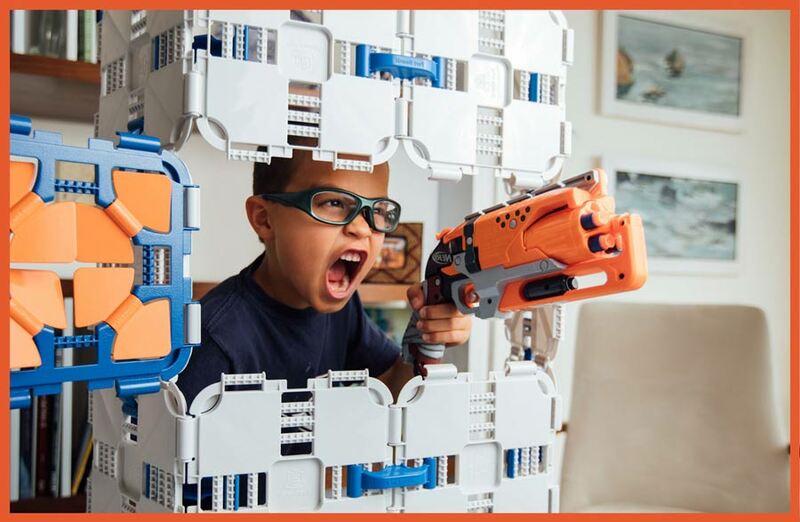 Blaster Boards combines the best of Lego and Nerf to keep your kids entertained for years.